It happened today at 2:09 AM. A minor 4.0 earthquake let loose on the other side of our nearby mountains. It woke Helaine from a sound sleep. As she came to her senses, “I could still hear the house moving.” That’s sufficiently scary. Doppler, who was also sound asleep, woke up and stood up. I had fallen asleep on the couch downstairs while watching TV¹. I never did wake up for the quake. 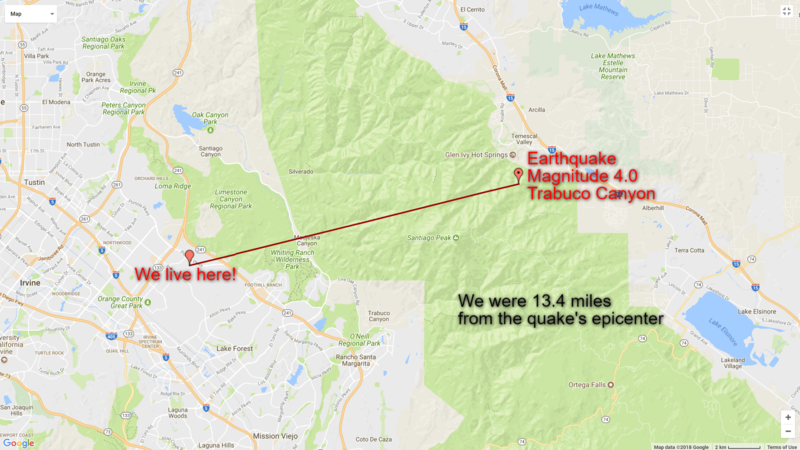 The large faults that run through Southern California aren’t nearby. Irvine isn’t considered earthquake challenged. Though a 4.0 will get your attention, it’s not enough to do damage, especially with the more stringent building codes here. This is our second noticeable quake and the second time I’ve been sleeping. The last time Helaine woke me quickly enough that we were still in motion. Of all the bad things that can happen in this world earthquakes continue to be near the bottom of my list. This map shows the plotted responses to the USGS’s “Did you feel it?” page. ¹ – It’s well established in the Fox house if I’m watching TV on the couch with my glasses off sleep is imminent. When we were in Florida we had tornados and hurricanes here in CT we have blizzards and hurricanes you guys have earthquakes there is something everywhere I guess. Glad you are safe. Miss you on channel 8 news here in East Haven. The important thing is everyone is safe.